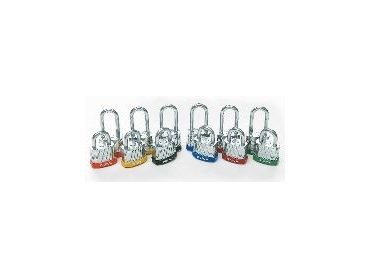 Brady’s new padlocks are available in six colours. BRADY Australia has introduced two new padlocks, designed for use in lockout and industrial applications. The Brady Safety Plus padlock and the Brady Steel Padlocks are the newest additions to the Brady ‘Be a Lifesaver’ lockout tagout range. The Safety Plus Padlock complies with OH&S lockout requirements. It helps keep workers safe and equipment free from damage. Rugged, yet compact and lightweight, the locks are constructed of reinforced nylon for superior chemical, corrosion and temperature resistance. The six-pin cylinder resists tampering and is well suited for use in harsh industrial environments. The Safety Plus Padlock lives up to its name. The body is non-conductive and resists sparking, making it a safer alternative than metal locks when used in proximity to electrical equipment. The patented non-conductive key chamber prevents an electrical charge from travelling from the shackle to the key. The Brady Steel Padlock is designed for a wide range of heavy-duty industrial applications, offering the optimum in security and durability. It is suited for use in general security applications including lockout and the securing of toolboxes, equipment cribs and more. The padlock features a five-pin cylinder (instead of the four pin cylinder found in most other locks) making it tamper-resistant and reducing the chance one worker's key will open another worker's lock. Countersunk rivets and a hardened steel shackle provide added protection, while a paracentric keyway with drill protection makes the lock difficult to pick. The lock is built to withstand heavy use in the toughest industrial applications, and is resistant to chemicals and corrosion. The body plates are individually coated prior to lamination for maximum rust prevention. The self-healing zinc coating allows the coating to migrate and heal itself when scratched. Both padlocks are available in six distinctive high visibility safety colours with the option of custom keying and Danger labels are also available and are sold separately. Padlocks are an essential component in a facility's lockout/tagout program that ensure the safety of employees.